Just imagine if 3 Palestinians were abducted and killed by extremists minded Israelis and Palestine launched attacks killing over 260 Israelis including women and children in just 8 days. Would the Western government proclaims that Palestine has a right to defend its territory? Barack Obama continues to disappoint as the most powerful Head of State on the planet. Or is that a hollow title these days? His unconditional support of Israel’s Prime Minister Benjamin Netanyahu punitive actions is pitiful. Off camera comments by Obama to Sarkozy in 2011 showed his real view on Netanyahu “you’re fed up? I have to deal with him every day”. The Israeli PM openly supported Obama’s opponent Mitt Romney in the last US elections in disregard for protocol and disrespect for a sitting President. Yet Obama plays possum to the Israeli government’s continued bombings of Gaza. The US leader had a chance to make a difference but has failed to show balanced in his approach to the troubles there. Barack Obama knows quite well Netanyahu does not like or respect him yet the US Commander in Chief swans around lackey promising to support his “friend” no matter who gets killed innocently on the Palestinian side. Will Michelle Obama be posing with a #gazaunderattack sign for the Israeli government to halt the slaughter of Palestinian children? Does Obama think it could have been his daughter slaughtered in this random manner? [Over 56 Palestinian children have been killed by the US governent’s closest ally since July 7]. The minute Fatah and Hamas announced in April an end to their mutual hostilities, Netanyahu cried foul and promised that Palestine would pay dearly. So are the week’s bombing part of that Israeli government payback? The sad deaths of those 3 Israeli teenagers cannot justify such actions and Netanyahu must have been planning this assault following the Fatah Hamas truce. These attacks just create more animosity in Palestine against Israeli government and just increase the support for the armed wing of Hamas. As long as the US do or say nothing of real significance that is fair and impartial the killings and destruction will continue on both sides. In 2012, during one of her final TV interviews as US Secretary of State, Hillary Clinton told Andrea Mitchell of MSNBC that she believed the Palestinians should have their own state. A point that Mitchell failed to allow Clinton to expand on as the interview ended right there. Why Hillary did not push the Palestinian statehood cause during the 4 years she was in office? Given the US drone programme in Afghanistan and Pakistan that has led to innocent people being killed are Obama’s and Netanyahu’s defence strategies one of a kind? Yesterday was Nelson Mandela Day and at Mandela’s funeral last December Obama said. “Mandela showed us the power of action; of taking risks on behalf of our ideals. Perhaps Madiba was right that he inherited, “a proud rebelliousness, a stubborn sense of fairness” from his father. 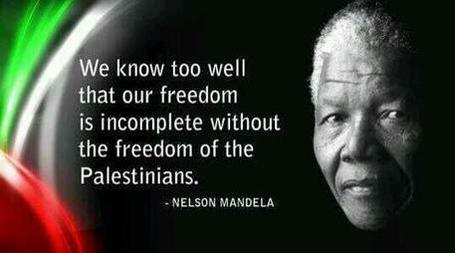 The Palestine-Israel situation requires the leadership that would be fitting of Madiba’s legacy. This entry was posted in israel, UK NEWS and tagged EUROPE, gaza, HILLARY, middle east, netanyahu, obama, usa. Bookmark the permalink.